Researchers can design the perfect molecule to edit a gene, treat cancer or guide the development of a stem cell, but none of that will matter in the end if they can't get their molecules into the human cells they want to manipulate. The solution to that problem, described in a study published October 31 in Science Advances, could be miniscule nanostraws, tiny glass-like protrusions which poke equally tiny holes in cell walls to deliver their cargo. "What you're seeing is a huge push for gene therapy and cancer immunotherapy," said Melosh, who is also a member of Stanford Bio-X, Stanford ChEM-H and the Wu Tsai Neurosciences Institute, but existing techniques are not up the challenge of delivering materials to all the relevant human cell types, especially immune cells. "They're really tough compared to almost all other cells that we've handled," he said. That was the state of affairs until just five or six years ago, when Melosh and colleagues came up with a new way of getting molecules into cells, based on Melosh's expertise in nano materials. 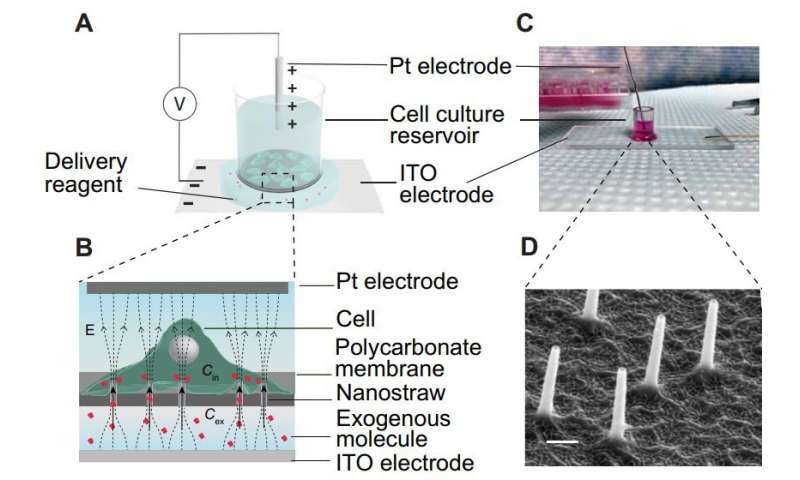 They would use electroporation, but do it in a vastly more precise way with nanostraws, which because of their relatively long, narrow profile help concentrate electric currents into a very small space. At the time, they tested that technique on animal cells sitting atop a bed of nanostraws. When they turned on an electric current, the nanostraws opened tiny, regularly sized pores in the cell membrane—enough that molecules can get in, but not enough to do serious damage. In the new paper, Melosh and team showed that the answer was yes—they successfully delivered molecules into three human cell types as well as mouse brain cells, all of which had proved difficult to work with in the past. What's more, the method was more precise, faster and safer than other methods. The nanostraw technique took just 20 seconds to deliver molecules to cells, compared with days for some methods, and killed fewer than ten percent of cells, a vast improvement over standard electroporation. Melosh and his lab are now working to test the nanostraw method in some of the hardest to work with cells around, human immune cells. If they succeed, it could be a big step not just for scientists who want to modify cells for research purposes, but also for medical doctors looking to treat cancer with immunotherapy, which right now involves modifying a person's immune cells using viral methods. Nanostraws would not only avoid that hazard but could potentially speed up the immunotherapy process and reduce its cost, as well, Melosh said.